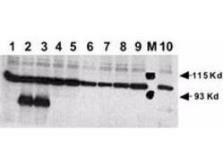 Specificity/Sensitivity: This antibody reacts with mouse Notch constructs present in lysates of HEK 293 cells. Only the cleaved intracellular (activated) form (NICD) is detected. No reactivity is detected against mouse N2, N3 or N4. The immunogen epitope is only exposed after gamma secretase cleavage and is not accessible in the uncleaved form.